Some board games not only require you to implement a good strategy, they require you to negotiate with the very opponents you're trying to defeat. These are my picks for the best negotiation board games. For 2 to 7 players, ages 12 and up. Designed by Allan B. Calhamer, published by Avalon Hill. Europe, circa 1900. Up to seven powers compete to control the continent by making and sometimes breaking promises as armies and navies move around the board. 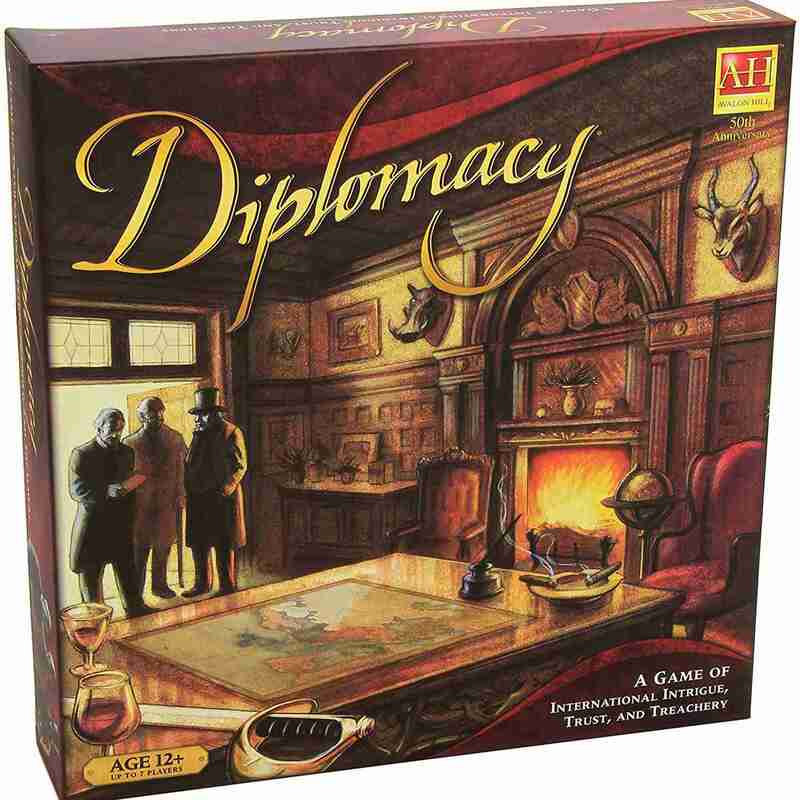 Be ready to spend most of an entire day (each game takes about six hours) playing Diplomacy, but if you're into negotiation games there is none better. For 3 to 6 players, ages 12 and up. Designed by Sid Sackson, published by Face 2 Face Games. I'm the Boss is a masterful game in which players try to perfect the art of the deal. On your turn, you're the boss—and you decide if a deal's worth trying to make or not. Of course, someone else can try to take the "boss" title away from you. Or they could tie up key investors so the deal can't be made. This is probably the ultimate fast-paced wheeling and dealing board game. For 3 to 5 players, ages 12 and up. Designed by Karsten Hartwig, published by Alea (original edition) and Z-Man Games. Just about everything can be negotiated in this board games. Each round, players acquire properties on various city blocks, then are given randomly drawn tiles which represent businesses (such as a factory, a restaurant, and a laundry). At that point, players negotiate using the properties, the businesses, and their cash to try and build businesses with enough adjacent squares to earn bonus payments for a completed business. Every tile played provides some sort of cash back, but victory will be difficult without at least one or two completed businesses. For 3 to 5 players, ages 12 and up. Designed by Stefan Dorra, published by Mayfair Games/Amigo Spiel. Intrigue is one of the nastiest negotiation games, which is part of the reason we enjoy it so much. Players are Renaissance-era families looking to secure jobs in the other families' businesses. The main tool at their disposal is bribery. Unfortunately, any player accepting a bribe is under absolutely no obligation to honor and commitments that are made. Before starting a game of Intrigue, be sure you're playing with people who will still be your friends when it's over. For 2 to 5 players, ages 12 and up. Designed by Rüdiger Dorn, published by Alea/Rio Grande Games (original edition) and Asmodée Editions/Filosofia. On every turn, every action is negotiated. "Who will pay me to move into this building? How much?" As with most negotiation games, you have to play with the right crowd or else risk games that drag on for too long. But Genoa, previously released as Traders of Genoa, is full of tough negotiations. For 2 to 7 players, ages 12 and up. Designed by Ben Grossman, Eric Goldberg, and Vincent Tsao, published by West End Games. Players, working as ruling families of the mythical la Republica de los Bananas, try to connive, cajole, threaten and (occasionally) ally their way to the biggest bank account. The first step is to elect El Presidente, then to determine how large his budget is. But determining the budget is not simple—El Presidente draws a number of cards but keeps the amount on those cards secret when he proposes his budget for the year. So no one will know for sure how much he keeps for himself. For 3 to 6 players, ages 12 and up. Designed by Bruno Faidutti, published by Descartes Editeur. Killing dragons is easy. Splitting the loot is the difficult part. In this clever game, players work together to slay dragons and claim their treasure. Once the dragon is dispatched, you have exactly one minute to come to an agreement on how the gold and gems get divided—if you don't, no one gets anything. For 3 to 5 players, ages 10 and up. Designed by Reiner Knizia, published by Mayfair Games/Amigo Spiel. Players are members of the Roman Senate, looking to advance to top leadership positions. But the only way to move up through the committees is to win a majority of the vote—and doing that usually means getting support from your opponents. The good news is that you do win prestige points for supporting opponents. Once the five top positions have been filled, the game ends. Of the players with a Senator in the top five, the one with the most prestige wins. For 3 to 6 players, ages 12 and up. Designed by Ronald Wettering, published by Z-Man Games. If any game is nastier than Intrigue, it's Lifeboats. Here, a boating accident has left players spread out over six lifeboats. Everyone wants to make it to one of the islands ahead, but the boats are springing leaks and pawns are swimming from boat to boat—​all while only one boat moves forward each turn. If a full boat springs another leak, the players in the boat vote on who to toss overboard. The player who earns the most points by having his pawns reach shore safely wins. For 3 to 5 players, ages 10 and up. Designed by Bill Eberle, Bill Norton, Jack Kittredge, and Peter Olotka, published by Fantasy Flight Games. Negotiation isn't all that it takes to win Cosmic Encounter, but it certainly helps. Each player controls an alien race with a unique special power and is trying to be the first to establish five colonies on planets outside his home system.